It is convenient to use a powerful software for creating flow charts. Now we have the best flow chart online design software - ConceptDraw DIAGRAM enhanced with Flowcharts Solution from the "Diagrams" Area of ConceptDraw Solution Park. 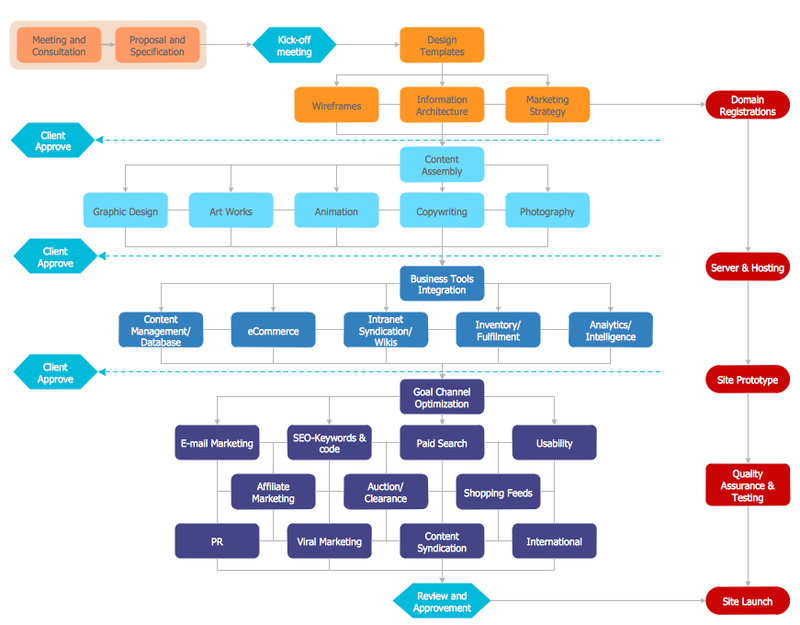 Flowcharts Solution is so powerful flow chart online maker thanks to wide set of included tools and services. 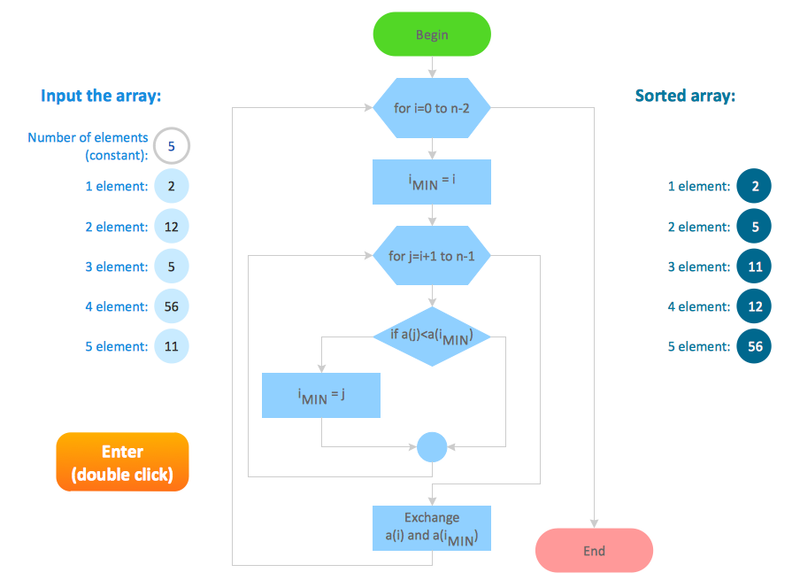 To create flow chart online, use primarily the ConceptDraw STORE which is an excellent tool for navigation through ConceptDraw Solution Park. It gives an access to the libraries, templates and samples, and also lets to manage downloads and updates. 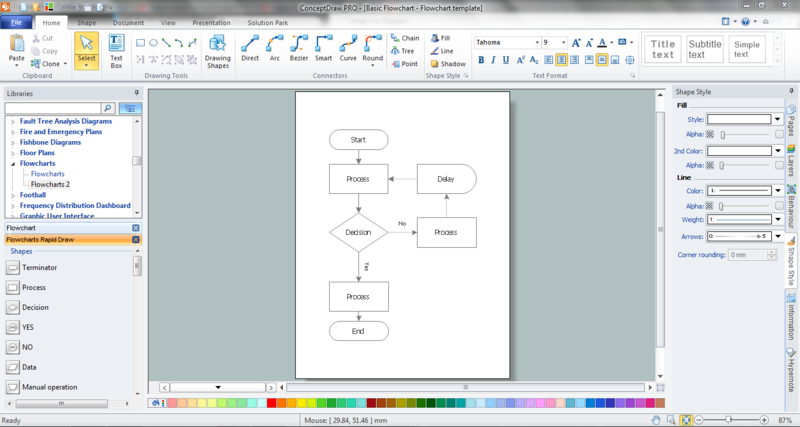 The best flowchart maker uses the Flowcharts solution of ConceptDraw Solution Park. 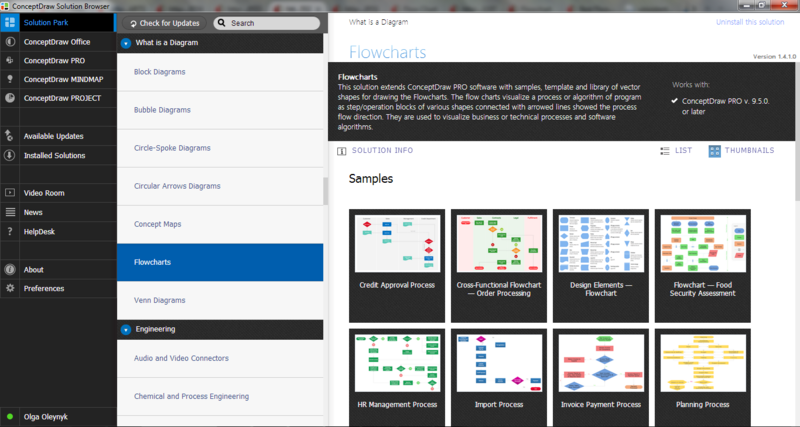 Flowcharts Solution provides 2 libraries with numerous ready-to-use vector objects, collection of predesigned flow chart diagrams examples and samples, and the perfect base for easy flowcharting - basic flow chart template. Use basic flow chart template for easy drawing flowchart, business process flow chart, online flow chart, data flow chart diagram, and many others. All samples and template are available from the Flowcharts section in ConceptDraw STORE. A Process Flow Diagram (PFD) is a diagram which shows the relationships between the main components in a system. Process Flow Diagrams are widely used by engineers in chemical and process engineering, they allows to indicate the general flow of plant process streams and equipment, helps to design the petroleum refineries, petrochemical and chemical plants, natural gas processing plants, and many other industrial facilities. ConceptDraw DIAGRAM v12 diagramming and vector drawing software extended with powerful tools of Flowcharts Solution from the "What is a Diagram" Area of ConceptDraw Solution Park is effective for drawing: Process Flow Diagram, Flow Process Diagram, Business Process Flow Diagrams.